I'm a huge fan of Yotam Ottolenghi and a couple of weeks ago I held an Ottolenghi inspired dinner in my home. The menu was hard to put together because all of his food is so beautiful. These stunning Sweet Potato Galettes were the perfect start to my Ottolenghi inspired dinner or any dinner for that matter. These beautiful and delicious galettes were so easy to make. I served them warm but they are just as good at room temperature. Enjoy! 1. Preheat the oven to 400*F Bake the sweet potatoes in their skins for 35 to 45 minutes, until they soften up but are still slightly raw in the center (check by inserting a small knife). Leave until cool enough to handle, then peel and cut into slices 1/8 mm thick. 2. While the sweet potatoes are in the oven, roll out the puff pastry to about 1/16 inch thick on a lightly floured work surface. Cut out four 2 3/4 by 5 1/2-inch rectangles and prick them all over with a fork. Line a small baking sheet with parchment paper, place the pastry rectangles on it, well spaced apart, and leave to rest in the fridge at least half an hour. 3. Remove the pastry from the fridge and brush lightly with the beaten egg. Using an icing spatula, spread a thin layer of sour cream on the pastries, leaving a 1/4-inch border all round. Arrange the potato slices on the pastry, slightly overlapping, keeping the border clear. 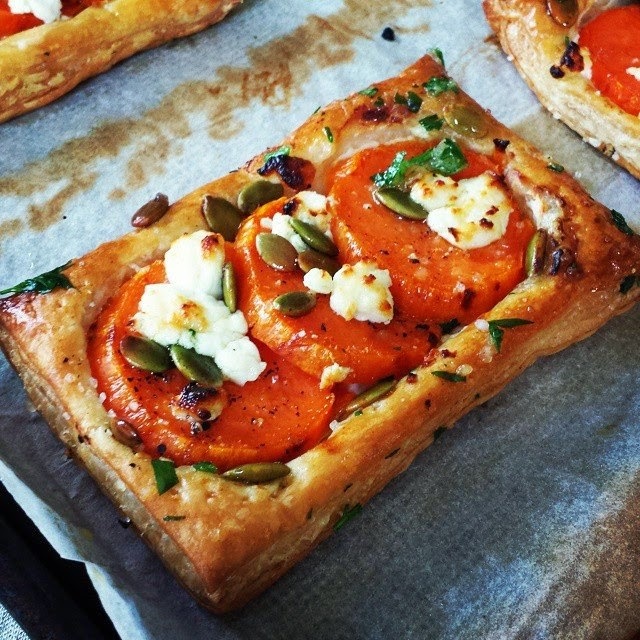 Season with salt and pepper, crumble the goat cheese on top, and sprinkle with the pumpkin seeds and chile. Bake for 20 to 25 minutes, until the pastry is cooked through. Check underneath; it should be golden brown. 4. While the galettes are cooking, stir together the olive oil, garlic, parsley, and a pinch of salt. As soon as the pastries comes out of the oven, brush them with this mixture. Serve warm or at room temperature. Wow! That is a beautiful galette!